A frog levitating thanks to the power of molecular magnetism. 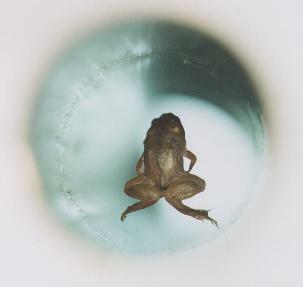 This frog is hovering inside a magnet (not on board a spacecraft). This is the first observation of magnetic levitation of living organisms as well as the first images of diamagnetics levitated in a normal, room-temperature environment. In fact, it is possible to levitate magnetically every material and every living creature on the earth due to the always present molecular magnetism. The molecular magnetism is very weak (millions times weaker than ferromagnetism) and usually remains unnoticed in everyday life, thereby producing the wrong impression that materials around us are mainly nonmagnetic. But they are all magnetic. It is just that magnetic fields required to levitate all these “nonmagnetic” materials have to be approximately 100 times larger than for the case of, say, superconductors.